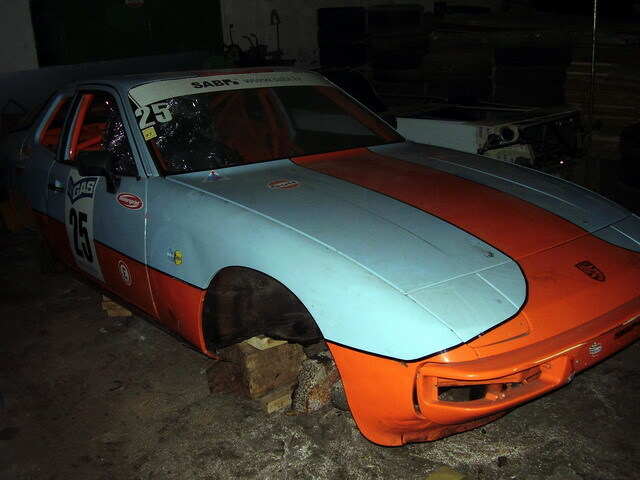 924Board.org :: View topic - Raceboys track car project, 924S/931 "Gulf"
Raceboys track car project, 924S/931 "Gulf"
Posted: Thu Sep 18, 2008 11:32 pm Post subject: Raceboys track car project, 924S/931 "Gulf"
Thought I throw some pics about my track car project that I've been working on since December 2007. 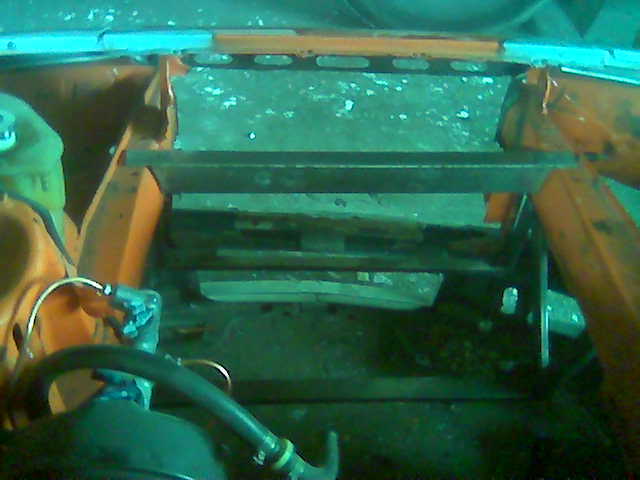 I bought the shell with roll-cage and paint-job done from my Latvian friend Alfreds. He raced it with 924 NA engine (built with 931 head and VEMS efi by me) and decided to make a new and more powerful track car of his 951. 931 engine with VW flat-tops, K27/29 hybrid, Holbert/GTR intercooler, ITB intake, 630cc Siemens Deka injectors and Bosch 044 running E85. 931 dog-leg gearbox, alloy rear arms, custom solid aluminium anodized mounts, Racers Edge uniball A-arm mounts, 951S brakes all around, BBS RS 16x8 and 16x9 forged 3piece wheels. Dash is covered with black alcantara, I'm using stock gauges+LCD display for VEMS and two progressive shift-lights. For some reason this car has late-style windshield. nice project ! post more pics when you put it all together. I love it! 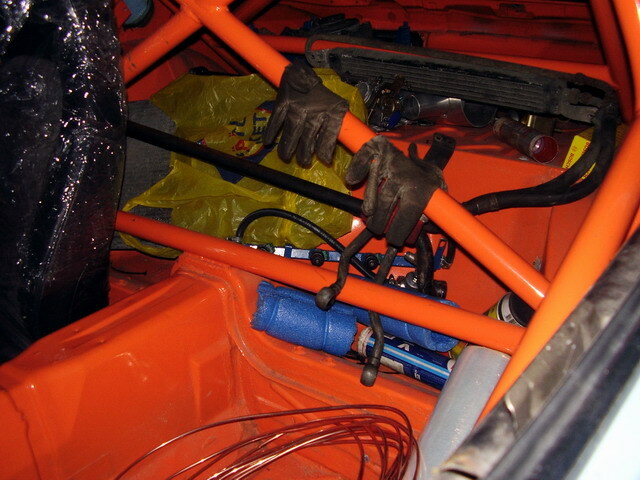 Isn't the cross brace for the harnesses on the roll-cage sort of low? Unless you are really short. Peep, great pix, I've been curious about that car for some time...is it going to be running the Holbert IC I sent you? Looks like my upper cross member design works for you? 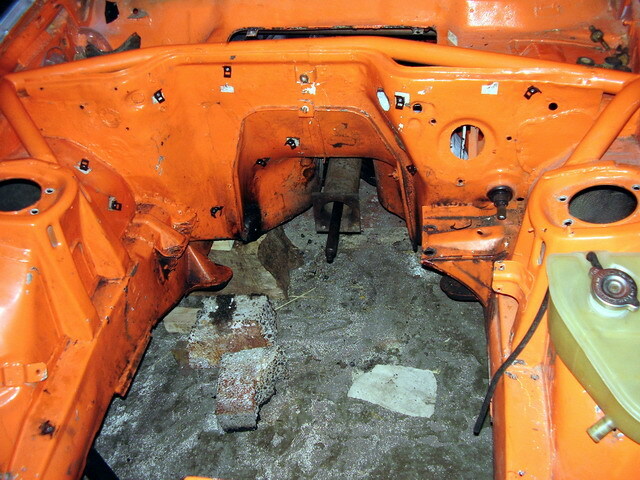 I love the orange in the engine bay and interior!!! How's that snailshell? Does it have LSD? Very interesting that you're running E85! What boost level will you be running and how do you control detonation at such a low octane? e85 have an octane number somewhere between 100-104 if i remember correctly, So if you can handle the extra fuel theres room for quite a raise in boost pressure.. I have various pics of the parts used on this car all over the board posted earlier. Snailshell is in perfect shape (at least it was 4 years ago when I last drove it ), no LSD (that will be one of the first changes after the car get's running). Chrenan, the cage has upper cross-brace alos and that is for harness actually. With E85, I can run LESS advance to get the same power at the same boost level, but I can run more advance if Iwant to go higher. I have fabricated the fuel rail out of stainless steel for this reason, not sure what to do about fuel cell. And one more thing that many have asked about. 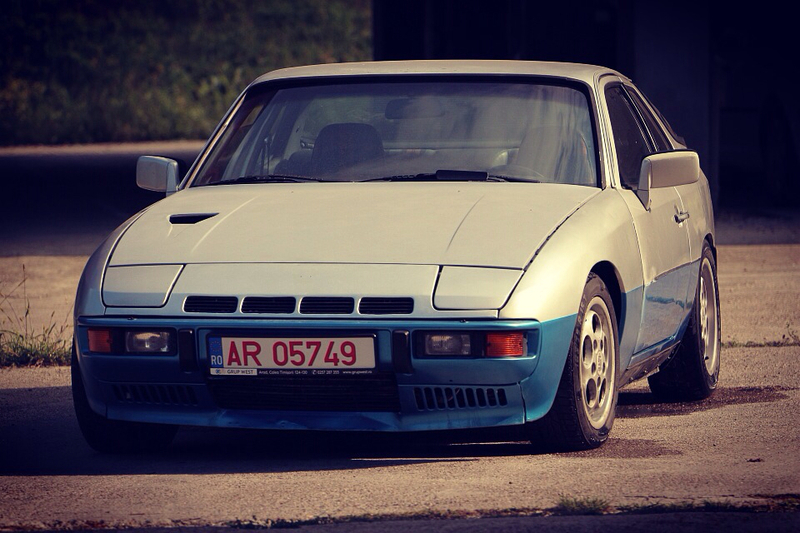 This car will be standard 924 body, I like the way it looks now. So far no GTR fenders, but maybe someday they will be needed. 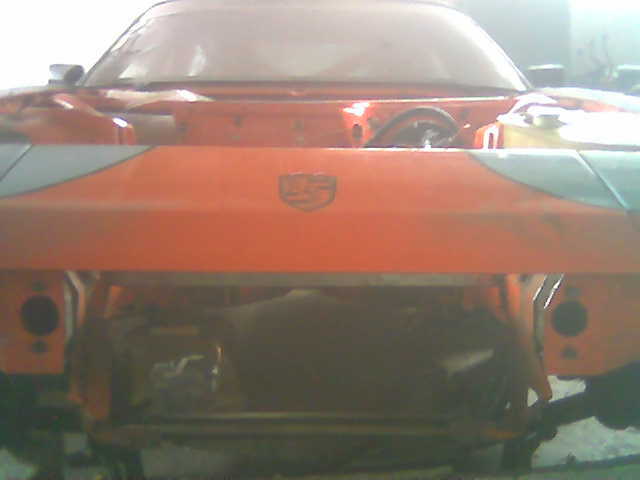 I have custom lightweight front bumper assembly for it, so standard euro bumper goes and lightweight rear bumper. I'm not sure about the Le Mans rear valance, maybe I'll make lightweight copy of it, then it stays. Wow! Learned something new today! You're right...man, this opens up a whole new thought process on fueling for the UWB... Bwahahahahah! Depending on composition and source, E85 has an octane rating of 100 - 105 compared to regular gasoline's typical rating of 87 - 93. This allows it to be used in higher compression engines which tend to produce more power per unit of displacement than their gasoline counterparts. Since the reciprocating mass of the engine increases in proportion to the displacement of the engine E85 has a higher potential efficiency for an engine of equal power. Raceboy, i saw different coil types at your pictures. Which you will recomend? 4in1, 2in1 *2, separate? 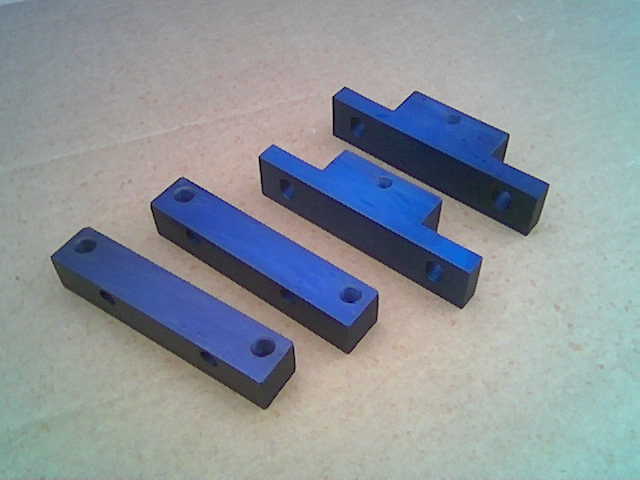 Maybe you know good part numbers. Do you have missfire on idle speed in megatune? Unusual colour but I quite like it. E85 makes an excellent choice for a race only car. Is it available everywhere in Europe? Has only now come to Oz but is not yet legal and very difficult to get. Considering the different density, combustion rate and AFR are you just going to map your VEMS solely on E85? Does VEMS support a flex fuel sensor and compensate for various percentages? Also, since it has been around for a while in Europe is there many reports of problems caused by aluminium corrosion? Particularly on 5083 (marine grade) that I used? Note you said you have a stainless fuel rail. What about the fittings? Keep at it and take some more pix as you go. Most of the reading I've done indicates that the corrosive concerns that are commonly brought up are generally only a concern for 70s and earlier engine components, and wildly over exaggerated for 80s onward, especially when running synthetic oil (which I do). As for the fuel lines, the tank-to-engine bay lines are steel, so no worries there. It's the stock CIS lines that would be problematic, but in the case of EFI, normal stainless braid over teflon makes that worry go away. That leaves the gas tank and the fuel pump. I'm very very curious how those two issues were addressed on this car. In the meantime, one solution to the gas tank I read is to have the stock unit nickel-plated, which purportedly has the same anti-corrosive properties as stainless steel. I'm currently researching race style fuel cells to see if any of them are rated as E85 safe....which seems highly likely given the recent surge in E85-fueled race cars. That leaves the fuel pump. Haven't gotten very far on this one, but it seems there is some significant concern about using any wet-style pump that is not specifically manufactured for E85. 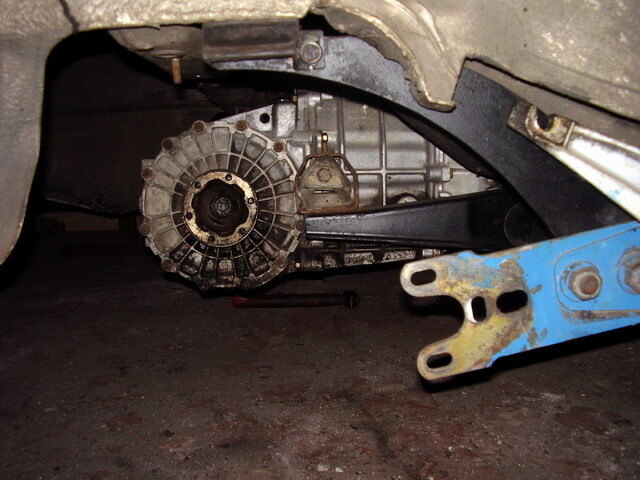 All of them will do, most cost-effective is coil-pack for Opel (costs 50eur new) and I'm using one right now. I can give part number later. No misfires whatsoeer, idles very smooth. Bosch 044 fuel pump will work for E85 but not as long as on gasoline, though lifespan is enough not to worry. I have no info on E85 effects on different aluminium types but I also wouldn't like experiment with it. VEMS has dual-map option but not with flex-fuel sensor yet. I'm not worrying about it also as my racecar will be E85-only. Though I might tune it up on gasoline also, just in case. Not sure about your formulations over there, but from what I've read, in North America the formulations can run anywhere between 100 to 105 Octane rating. This fact, combined with that for the mass market it was necessary to have a solution that could run both E85 and normal pump gas, causes the need for the E85 sensor, which can adjust spark dynamically based on how much ethanol it's seeing. Some guys on the WRX boards are running a 50/50 mix of E85 and premium pump gas. If you could isolate a supplier that could give you a consistent and known formulation of E85, a blend like this might be the ideal way to tune (in terms of margin of safety), lacking the ability to run a sensor. The ECU I am planning to pick up already supports E85 sensors, so this is a very appealing path to me. Regarding the Bosch 044 pump, is that the stock unit we use (sorry, I'm blissfully ignorant of the Bosch designations)? Will the Pierburg replacements work too? What about the in tank pump? (Those were cited as cause for concern too in E85 configs). I think when they say 100-105, its not like each time you fill up that you may have the variance, but there is a "winter mix" and a "summer mix" because of the weather and the octane rating and issues with cold starting, etc. However, there may be some small variance between tanks. Agreed, but I think the variance is also from brand to brand, i.e. Shell might provide 100 octane, while Sunoco may provide 104 Octane, and yet it is all branded, marketed and labeled as E85. good way to go raceboy.